In 2008, we can now say the carbon dating in 1988 is invalid. In early 2005 The American Chemical Society website quoted Raymond Rogers, a Fellow of the Los Alamos National Laboratory: "The observations do not prove how the image was formed or the 'authenticity' of the Shroud. There could be a nearly infinite number of alternate hypotheses, and the search for new hypotheses should continue." At about the same time, Philip Ball, who had been the Senior Editor for Physical Sciences of the Nature Journal of Science when Nature published the results of the 1988 carbon 14 dating of the Shroud, discussed the new studies that challenged those tests, in the journal's online edition. He paraphrased Rogers: "It is, [Rogers] says, between 1300 and 2000 years old. Let's call it somewhere around the middle of that range, which puts the age at about 2,000 years. Which can mean only one thing . . ."
Why all this attention to the Shroud of Turin Carbon 14 testing? Raymond Rogers had just published an article in the peer-reviewed scientific journal Thermochimica Acta (Volume 425 pp. 189-194) that proved that the 1988carbon 14 dating in was incorrect. And simultaneously, John L. Brown, formerly Principal Research Scientist at the Georgia Tech Research Institute's Energy and Materials Sciences Laboratory at the Georgia Institute of Technology, independently confirmed many of Rogers’ findings. T]he age-dating process failed to recognize one of the first rules of analytical chemistry that any sample taken for characterization of an area or population must necessarily be representative of the whole. The part must be representative of the whole. Our analyses of the three thread samples taken from the Raes and C-14 sampling corner showed that this was not the case. Along with those findings, other information came to light that demonstrated that the radiocarbon dating of the Shroud of Turin may have been the biggest carbon 14 dating mistake ever made. As if that was not enough, Philips, who understood the fact, wrote in Nature, "It is simply not known how the ghostly image of a serene, bearded man was made," underscoring the other fact about the Shroud of Turin. Not only does no one know the real age of the cloth, no one knows how the images were made. They were not painted, as Philips points out. Nor were they some type of medieval photography. That, Philips thought was absurd. If we rely only on peer-reviewed science journals we know this: The Shroud of Turin is at least 1300 years old. The images are a darkening of an otherwise clear starch and polysaccharide coating thinner than most bacteria. The Shroud of Turin is not medieval. A Second Face image has been discovered on the reverse side of the cloth. The image is in registry with the facial image on the front of the cloth. The image is superficial meaning nothing soaked through to form the image. This discovery supports a hypothesis that the images were produced by bodily amine vapor/saccharides reaction. The second face picture makes faked images implausible. The History of the Shroud of Turin does not just begin in Europe in 1357. It is only accurate to state that there are no known European records of the Shroud before 1357. From a historical perspective, there is significant, reasonably sound evidence that the Shroud was in Constantinople until 1204 and before that in Edessa, an early Christian community. The Images are contained within a very thin coating of starch fractions and saccharides. The images are a chemical alteration to the coating. Chemical and spectra studies identify the image component as a caramel-like product. Coin Images of 1st century Roman lepta may or may not have been identified over the eyes. There is an Intriguing and compelling arguments, but there are scientific reasons to doubt the claim. Bloodstains on Shroud of Turin are real blood. Scientist after scientist have proven it is real blood. But no one, including a laboratory at SUNY, the State University of New York, has confirmed that the blood type is AB, as is often claimed. Negative Images. The picture on the Shroud of Turin is a realistic, photographic-like negative image. This remains one of the most puzzling characteristics of the Shroud's picture of Jesus. No one can explain how or why a faker of relics would have created such a picture. More About the Carbon 14 Dating: It was the prestigious peer-reviewed journal, Nature, that in 1989, reported that carbon 14 dating ‘proved’ the shroud was a fake. Rogers in defended the article in Nature and the quality of the carbon 14 dating. But Rogers found that the carbon 14 sample was taken from a mended area of the cloth that contained significant amounts of newer material. This was not the fault of the radiocarbon laboratories. But it did show that the dating was invalid. The idea that the shroud had been mended in the area from which the carbon 14 samples had been taken had been floating around for some time. In 1998, Turin’s scientific adviser, Piero Savarino, suggested, “extraneous substances found on the samples and the presence of extraneous thread left over from invisible mending" might have accounted for an error in the carbon 14 dating. Sue Benford and Joe Marino independently explored this idea with several textile experts and Ronald Hatfield of the radiocarbon dating firm Beta Analytic. There seemed to be clear visual evidence of 'invisible reweaving'. But the skeptically minded Rogers did not agree. He had already debunked every other argument so far offered to explain why the carbon 14 dating might be wrong. According to Ball, “Rogers thought that he would be able to ‘disprove [the] theory in five minutes’.” Instead he found clear evidence of mending. He also showed, with chemistry, that the shroud was at least thirteen hundred years old, twice as old as the radiocarbon date. And he proved, beyond any doubt, that the sample used in 1988 was chemically unlike the rest of the shroud and thus invalid. BTW: A Bioplastic Coating, formed by living, growing micro-organisms did not cause errors in C14 tests. If there is any bioplastic coating, the quantity is certainly too insignificant to make much of a difference. BTW: The Fire in 1532 did not alter the C14 to C12 isotope ratios. Nor did it introduce meaningful quantities of new carbon into the mix. There is no scientific basis for this claim. 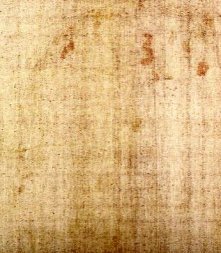 More About the fact that the images were not painted: Walter McCrone did not prove that Shroud was a painted picture of Jesus. And Bishop Pierre d'Arcis' (1389) claim that an artist confessed to painting the picture of Jesus on the Shroud is false. Modern forensics science proves both McCrone and d'Arcis wrong. McCrone was the only scientist to make this claim. Every other scientist who has tested and analyzed the image fibers disagrees with McCrone. Furthermore, McCrone's work is not peer reviewed and cannot be scientifically reproduced. And while it's true that d'Arcis made such a claim, he was doubted by his own peers. Historians also doubt that he was honest. Well documented chemical and spectral analysis prove that the Shroud's pictures were not painted. In his commentary in Nature, Philip Ball, who understood the chemistry of the shroud's images, said what shroud researchers had been saying for years: the images were not painted. Moreover, a 2003 article in the peer-reviewed scientific journal Melanoidins by Rogers and Anna Arnoldi, a chemistry professor at the University of Milan, demonstrated that the images were in fact a chemical caramel-like darkening of an otherwise clear starch and polysaccharide coating on some of the shroud’s fibers. They suggested a natural phenomenon might be the cause. The American Chemical Society website quotes Rogers: "The observations do not prove how the image was formed or the "authenticity" of the Shroud. There could be a nearly infinite number of alternate hypotheses, and the search for new hypotheses should continue." Much of the scientific material on this site is based on the work of Ray Rogers. Rogers, a chemist, is a science Fellow of the University of California, Los Alamos National Laboratory and a charter member of the Coalition for Excellence in Science Education. He has published many scientific papers in peer-reviewed journals and U.S. Government publications. In 1978, together with several other scientists, he was invited to personally examine the Shroud of Turin in Italy for several days. He collected numerous measurements and samples of fibers and particulate materials for further study. Rogers died on March 8, 2005 shortly after his article was published in Thermochimica Acta. Also: The Shroud of Turin for Journalists: Where Have All the Skeptics Gone? Independently, Ray Rogers, a Fellow of the University of California, Los Alamos National Laboratory and a charter member of the Coalition for Excellence in Science Education examined actual threads and fibers adjacent to where the samples were snipped. In a paper he published with Anna Arnoldi of the University of Milan, Rogers reported finding indisputable chemical evidence of a repair patch. He found dyestuff and spliced threads. Others, using scanning electronic microscopes and advanced spectral analysis tools have confirmed his findings. 24BIZ.biz - 24/7 online payday loans in USA. Face on the Shroud of Turin as it appears when photographed. This is the negative made from the image on the Shroud. Gum encrusted cotton fiber found only in the carbon 14 sample area and not elsewhere on the Turin Shroud. Threads consisting of twisted bundles of fibers. Shows color in starch coating. Second face image recently discovered with image analysis technology. This a a computer enhanced view. It matches the face on the front of the Shroud of Turin. The images are doubly-superficial meaning that nothing soaked through.